Borg Leather Riser Recliner Chair - Cream. This cream Borg Leather Riser Recliner Chair is tastefully upholstered in high grade leather and is very a practical and stylish chair. Designed to provide the user with exceptional comfort, this chair is ideal for activies such as reading or watching TV. This cream coloured Borg Leather Riser Recliner Chair can also raise the user to their feet at the touch of a button. This chair is cream in colour and as such complements a wide range of different environments. The single electric motor comes with a simple-to-use handset and is quiet to use. The smooth action means that this chair is very discreet to use. In addition, a battery operated back up system for use during power cuts is also included. 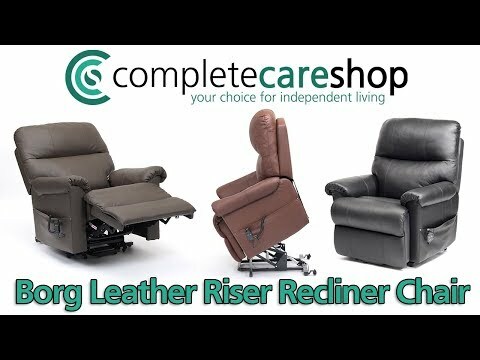 This cream coloured Borg Leather Riser Recliner Chair is also fitted with deeply cushioned, ergonomically-shaped pads for improved comfort and excellent postural support. A pocket on the side also provides the user with a safe place to store their chair's handset. The handset also has a lock fitted, preventing any accidental button presses at inopportune moments. This luxurious riser recliner chair also comes with a 12 month warranty on its wooden frame and electrical components, providing extra peace of mind.